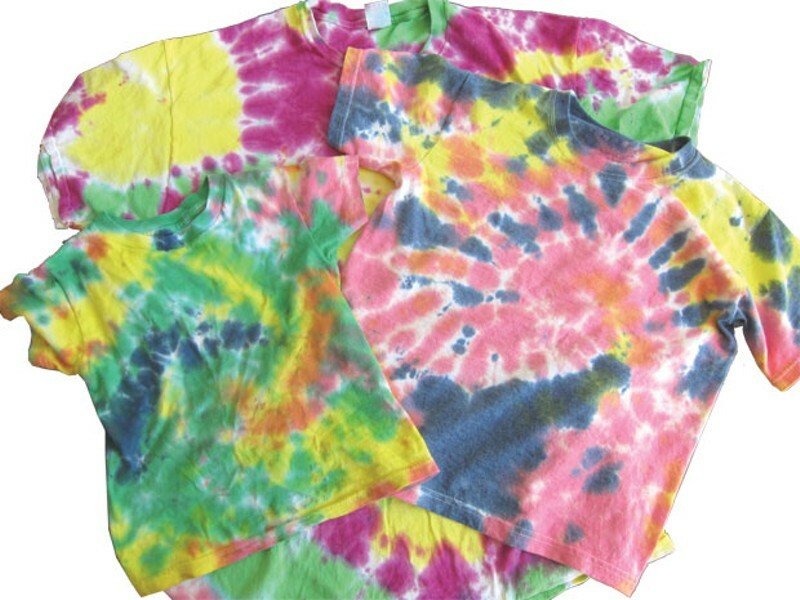 Tie-Dyed T-shirts | Project | Kids VT - small people, big ideas! A couple of years ago, Glamour tapped a tie-dyed top as a must-have piece, and now the hippy-trippy color scheme is back in style. You can buy tie-dyed T-shirts everywhere from Urban Outfitters to Target — or you and your kids can DIY. 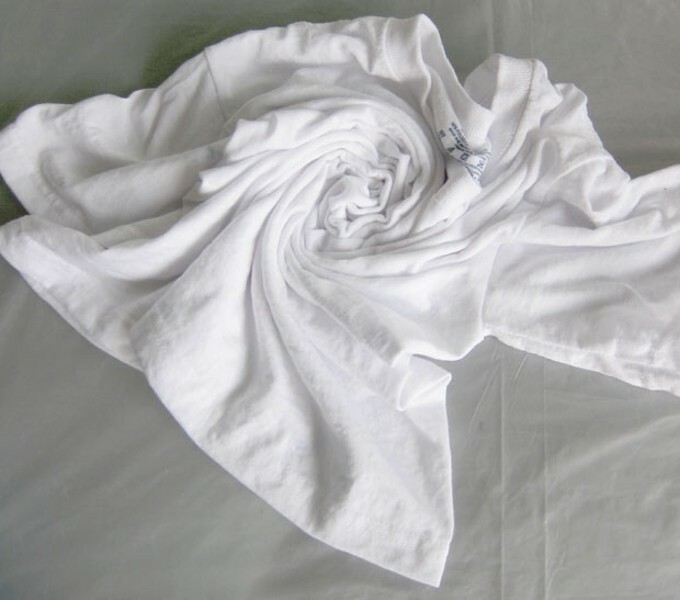 It's fun, and a great way to artfully revive your stained socks, shirts and onesies. Start by buying a kit — $12 to $20 at Jo-Ann Fabric and Craft. It'll give you everything you need in one box; we used one recently and had more than enough dye for four adult and two children's T-shirts, and two onesies. These instructions describe two tried-and-true tie-dye patterns, but you can also go freehand. 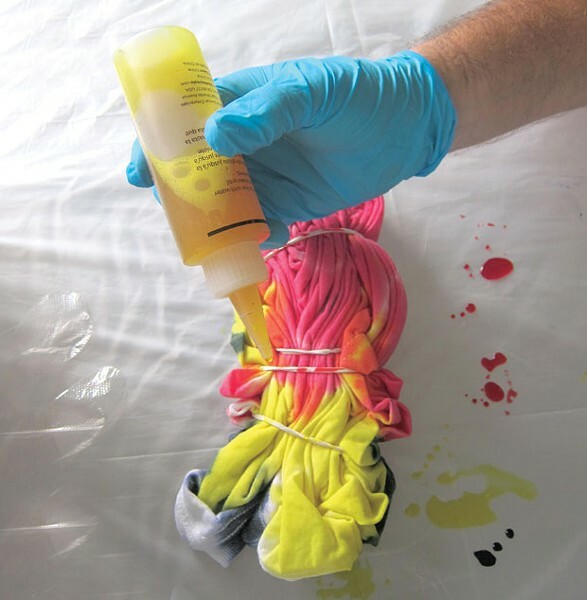 The dye has to set for several hours before you rinse it off, so if you're doing this project with a group, make it a sleepover or a two-part party. Prepare your space by covering a table with a disposable tablecloth or garbage bag. Arrange your kit items so that they're handy, then don your gloves. - To make a swirl pattern, put your fingertips down on the center of the shirt-front and turn the fabric as though you are turning a large dial. Once the item is wound around your fingers, slip several rubber bands around it, trying to keep the cloth folded into the swirl as much as possible. - To make a bull's-eye pattern, grab the center of the shirt-front and lift it off the table so that it hangs from your fist. Slip several rubber bands over the shirt at evenly spaced intervals. Each interval will be a ring of the bull's-eye. Once your clothing is folded and securely banded, lay it on the table and squeeze dye onto it and between the folded material. Flip the material over and squeeze dye onto the other side. 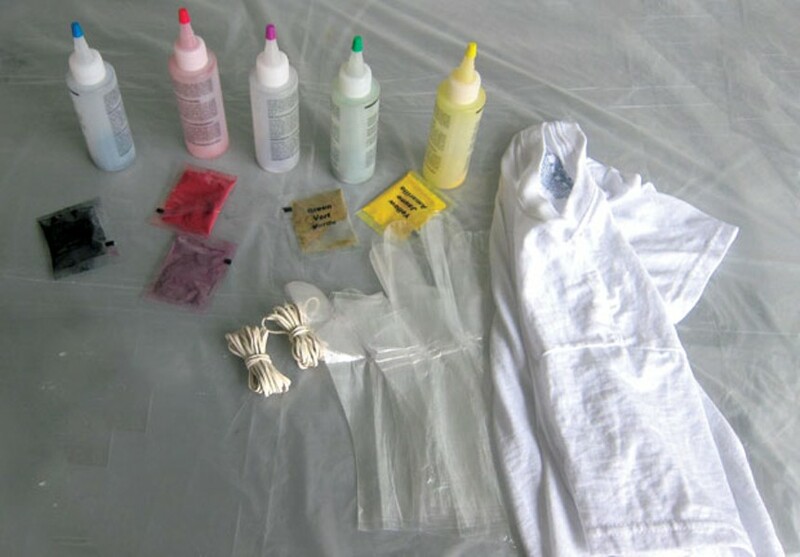 Place a single piece of dyed clothing into its own plastic bag or container to set for 6 to 8 hours, or overnight. The dye runs, so make sure to separate your projects. After the dye has set, use a garden hose or faucet in a stainless- steel sink to rinse out the clothing. Wash and dry the clothing before wearing.